Butterfly Project Installation in JBWS last Spring. 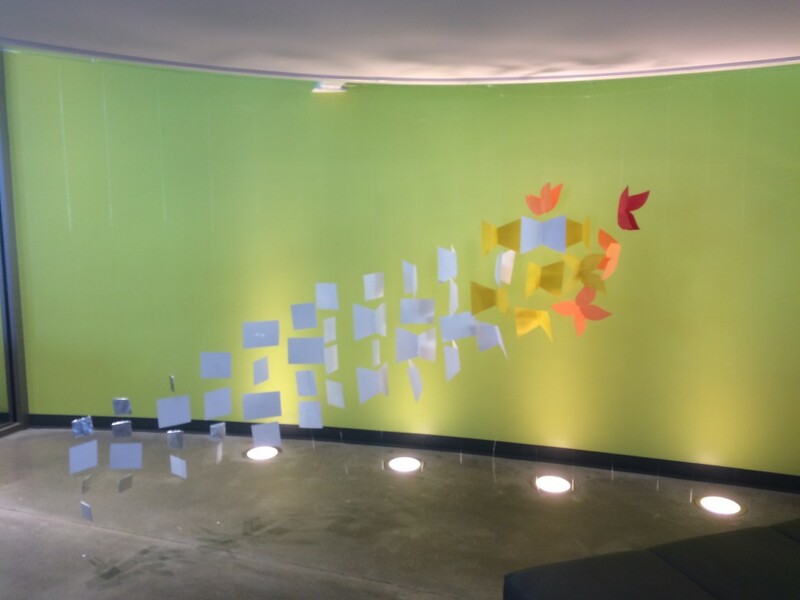 Those of you who wandered through JBWS last Spring might have noted the multiple iterations of paper “butterflies” suspended from our staircase in the lobby. That project, led by SEU Assoc. Prof. of Art Alex Robinson, was a pilot for the “Butterfly Project” art installation at the Bullock Museum as part of the exhibit, “State of Deception: The Power of Nazi Propaganda.” I encourage you to visit the exhibition if you are able — you may even recognize some of the butterflies in the exhibit from last spring. Between 1942-1944, more than 15,000 children passed through the Terezin Concentration Camp. The vast majority of these children did not survive the Holocaust. Brave teachers in the camp taught art lessons to the children as a form of therapy. Some of their poetry and art, saved in suitcases and later discovered, have been published in a book titled I Never Saw Another Butterfly. The poems and pictures drawn by the young inmates of Terezin illustrate the intense emotions of these displaced children, ranging from fear, sorrow, hope, and courage. The “Butterfly Project” at the Bob Bullock Museum consists of large fabric panels covered with thousands of uniquely colored butterflies, which will be suspended over the museum’s Grand Lobby. The butterflies were created and sent from every corner of Texas by children who were inspired by the poem The Butterfly written in 1942 by a young man imprisoned at Terezin. The butterflies represent endurance, change, hope, and life. By contributing a butterfly these youngest Texans committed to take a stand against intolerance. The exhibit is on loan from the United States Holocaust Memorial Museum.